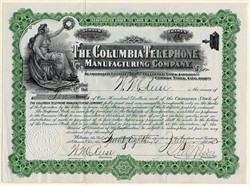 Beautiful certificate from the Columbia Telephone Manufacturing Company. 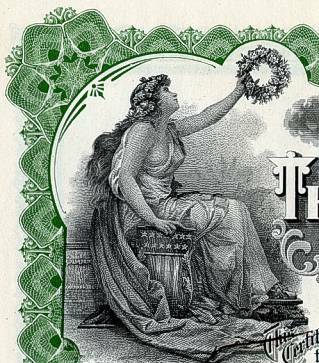 This historic document was printed by the Goes Company and has an ornate border around it with vignettes of Lady Liberty holding a wreath on the left side and an old telephone on the right side. This item has the signatures of the Company�s President, G. M. Riser and Secretary, William Reese and is over 108 years old. The Columbia Telephone Manufacturing Company was incorporated on March 6, 1902, under the laws of the state of West Virginia. Their principal place of business was at Ottawa, Putnam county, Ohio. It was formed for the purpose of constructing, selling, ana dealing in telephones, switchboards, and other electrical appliances, with an authorized capital stock of $250,000, divided into 2,500 shares of $100 each, which stock consisted of $100,000 at � per cent, noncumulative preferred stock, and $150,000 of common stock. The certificate of incorporation provided, among other things, that the common stock should be sold at 50 per cent of its par value in payments of 10 per cent as might be called by the directors, and upon such payments being made, the stock should be issued fully paid and nonassessable.